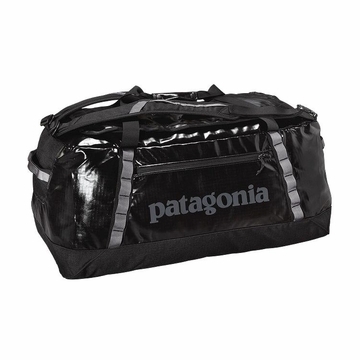 Perfect for gear-heads, the Black Hole Duffel 90L easily swallows a weeks worth of gear. For alpine climbers, river guides and ski patrollers, schlepping gear is in the job description. Thats why they choose our Black Hole Duffels. Highly durable and highly weather-resistant, these bags protect your gear from rough handling. The main compartment is accessed by a zippered U-shaped lid, which has a pair of zippered mesh pockets on the underside for small items. A zippered exterior pocket holds the stuff you need to access quickly. The padded bottom panel adds structure and helps cushion the load when your duffel gets the baggage-handler treatment. Carrying options include webbing handles with a snap closure and haul loops at either end that facilitate linking multiple bags. Four daisy chains let you lash additional gear to the outside. Made from 15-oz 900-denier polyester ripstop (50% solution-dyed) with a TPU-film laminate and a DWR (durable water repellent) finish.